Verizon’s 4G LTE market total will reach 143 when they turn on another 26 and expand in others tomorrow morning. The teasing of this new batch of cities started back in August, with many of them going live well before they were scheduled to. By covering more than 160 million Americans – I’d say Big Red is well on its way to covering the entire nation by the end of 2013. Fort Smith and Jonesboro, Ark. ; San Luis Obispo and Santa Barbara, Calif.; Daytona, Fla.; Bloomington, Champaign/Urbana, Rockford and Springfield, Ill.; the Quad Cities, Ill./Iowa; Iowa City, Iowa; Shreveport, La. ; Kalamazoo and Saginaw, Mich.; Reno, Nev.; Las Cruces, N.M.; Fargo, N.D.; Canton, Lima and Mansfield, Ohio; Dyersburg, Tenn.; the Tri-Cities, Tenn./Va. ; and Austin, Beaumont/Port Arthur, Wichita Falls and El Paso, Texas. The company is also making major 4G LTE expansions on Thursday in San Francisco, Indianapolis and Cleveland/Akron. Seeing LTE yet? Wouldn’t doubt it if you were. 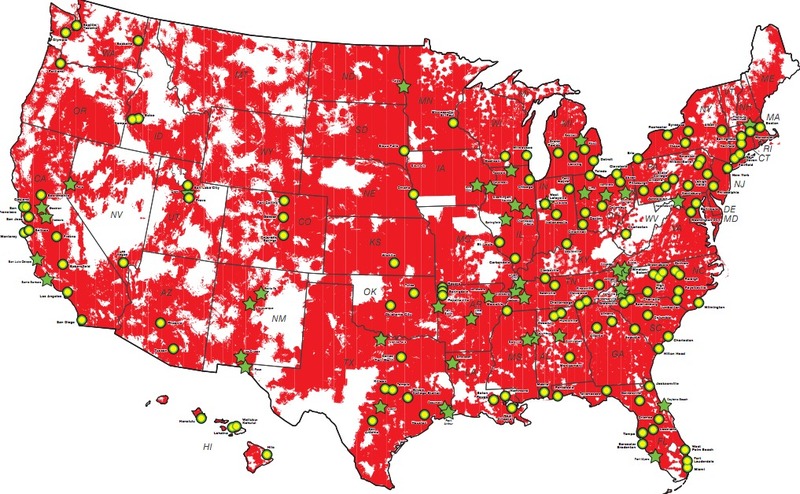 While Verizon Wireless’ 3G network covers more than 290 million Americans, the company’s 4G LTE network covers more than 160 million Americans and will be available in 143 cities on Thursday.